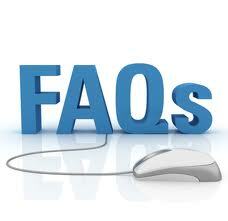 To view answer, click the question link, the answer will be displayed after clicking the link. What should I connect directly to the iMCA Controller? Under standard operating environment iMCA Controller only requires power and network cable. For advanced administration monitor, keyboard and mouse might be required. We purchased iMCA Controller directly from you. How / Where do you recommend positioning this box in the most optimal way? There are many ways of how iMCA Controller might be positioned within your infrastructure Given that it requires only power and the network (RJ45) or WiFi (optional) connection it makes this box very similar to any other network based equipment from connection and positioning point of view. The final decision of how and where to place our iMCA Controller will depend upon what version of the box you have purchased. If a "rackable" version of the iMCA Controller acquired (usually it takes no more than 1U space) then it can be installed into any rack cabinet. One of our most popular version of the iMCA Controller is "onboard" VESA adapter mountable, embedded computer. 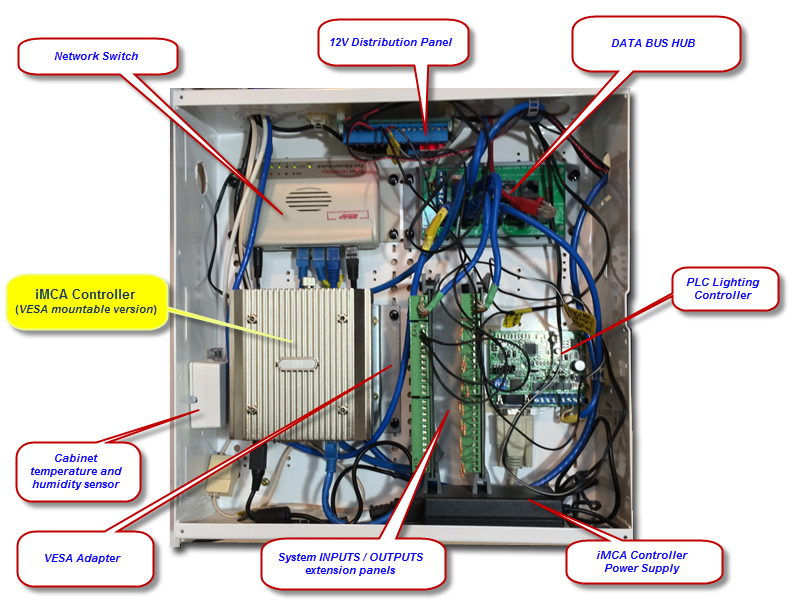 On the picture bellow you can see how this box has been placed into structural cabinet along side with network and security components of the overall automation system. How are software updates or patches installed once the system is purchased? Software version updates, patches or new technology modules can be installed via internal web interface module uploader. This can be done by you following our instructions or by us should you decide to grant remote access to your iMCA Server to our support personnel. We are manufactures and interested to get our hardware integrated with your system. What are the the technical requirements? It must be able to accept third party applications communicating directly with the device via HTTP, TCP or UDP protocol. For only sensing units - temperature, humidity, vibration, gas analyzers, power meters etc we need to be able to read (poll) the device (device's ports) state/status. For switching units apart of controlling switching mechanism (a relay for example) we must also be able to read its current state (ON or OFF). What is required to access iMCA Controller from internet? Know the external IP address allocated to your router. In most cases having a static IP address is ideal as it simplifies access to your system, eliminating unnecessary intermediate services. In some cases however (GSM internet network for example) allocating a static IP address may not be simple. In this case, the very reliable DynDNS service is recommended. It is easy to use and setup especially when your internet router does support DynDNS services. Use Network Allocation Table (NAT functionality must be supported) of your router to redirect public internet port (usually 80) to a private iMCA Server port (usually 80). Most modern routers including ADSL, GSM and Cable do support NAT functionality by default..
How long would it typically take for the iMCA Server to regain operation after power loss or a boot moment? Under most circumstances it should not take more than a 2 minutes. Can I buy any of the recommended hardware directly from you? Generally, yes you can! In some cases however it may be more economically viable for you to source it from a region closer to you, as you can save on postage and handling. Please use our support form to contact us. What technology interface adapter do I have use to integrate iMCA system with Power Line Carrier (PLC) x10 technology? You can control your X10 devices using X10 Universal Transmitter Module connected to any switching ports of any switching unit recognized by the iMCA System. If you use Elk / Ness M1 controller you can use 2-Way X10 XM10 Interface Module as most efficient and economical solution in this case. Only one module required for any number of X10 channels. Installation is simple. Just connect the XM10 to a 240V power point and then connect 4 core phone cable to both the XM10 and the Ness M1 Gold on board socket. That's all there is to it, any further instruction will be included within the instructions for your hardware. What technology interface adapter do I have use to integrate iMCA system with Power Line Carrier (PLC) PulseWorx - UPB Lighting Control System? You can control your UPB devices using ICM Input Control Module connected to any switching port of any recognized by the iMCA switching unit. The ICM Input Control Module is a high quality plug-in home automation interface device designed to transmit digital commands and status over the existing power lines upon sensing low voltage or contact closure events. Perfect for interfacing off-the-shelf motion sensors, light sensors, occupancy sensors, pressure mats, RF remote controls, push buttons, etc. to the PulseWorx Lighting Control System. If you use Elk / Ness M1 controller you can use Power line Interface Module as most efficient and economical solution in this case. Only one module required for any number of UPB channels. The PIM-R Power line Interface Module is a small plug-in device designed to be the interface between an RS232 port on a computer or dedicated controller (Elk / Ness M1 in our case) and the power line. Also PIM is the device of choice for interfacing PCS's UPStart Setup Software to the power line to setup all your UPB devices. The PIM-R plugs into any standard electrical outlet and its COM port via a DB9 serial cable plugs into M1 M1XSP extension module. What technology interface adapter do I have use to integrate iMCA system with Power Line Carrier (PLC) Clipsal C-Bus Control System? You can control your C-Bus devices using Auxiliary Switch Input Module (L5504AUX) connected to any switching port of any recognized by the iMCA switching unit. The C-Bus Four Channel Auxiliary Switch Input Unit, DIN Rail Series is a C-Bus input unit, which provides four independent input channels to facilitate remote access to C-Bus via a voltage free switch mechanism, such as the Clipsal 30M Range, the Clipsal Heritage Range or the Clipsal 56 Series Range of industrial switches. This allows Standard Range, 2000 Series, Metal Plate or Prestige Series switch plates and 3rd party products to be used with C-Bus. Alternatively, read, pressure, micro, or other switches may also be used to enhance the system flexibility. The unit incorporates the C-Bus 'Learn Mode' feature. Learn Mode allows the units to be programmed without the need for a PC connected to the system. Alternatively, the units can be programmed via a PC using the installation software. If you use Elk / Ness M1 controller you can use Ness C-Bus Interface Module to connecting Clipsal C-Bus networks as most efficient and economical solution in this case. Only one module required for any number of C-Bus channels. The Ness C-Bus Interface Module interfaces the Ness M1G and M1EZ8 to the Clipsal C-Bus networks. The Interface connects to the M1 via "PORT 0" (RS232 port) on the M1 panel, (or EZ8 / EZ24 panel) and includes a second RS232 port for connection of M1 Ethernet modules if required. This interface allows for 2 way communications in that it not only sends C-Bus commands to C-Bus, but also will listen and respond to C-Bus light changes. Connection to the C-Bus network is done via the "Clipsal SIM" module onboard the interface and no other interface such as a C-Bus PCI is required. The interface is a true plug and play interface with virtually no programming required to make it work. All lighting programming is done within the M1 via NessRP. The light No's 1-255 correspond to C-Bus Group addresses 1-255. What technology interface adapter do I have use to integrate iMCA system with Power Line Carrier (PLC) Xanura technology? You can control your Xanura devices using Xanura SAX35 Potential free actuator/interface connected to any switching ports of any switching unit recognized by the iMCA System. What technology interface adapter do I have use to integrate iMCA system with Power Line Carrier (PLC) Insteon technology? You can control your Insteon devices using I/O Linc - Insteon Low Voltage / Contact Closure interface connected to any switching ports of any switching unit recognized by the iMCA System.